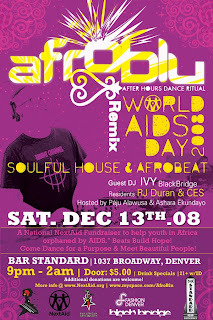 Join hostesses Peju Alawusa and Ashara Ekundayo for another one of their after hours dance rituals, AFROBLU - for WORLD AIDS DAY 2008 -www.myspace.com/afroblu. This national NextAid fundraiser www.nextaid.com promotes aids education and financially assists the youth in Africa orphaned by AIDS. Come get wild at another soulful house, afrobeat party with guest DJ IVY, Blackridge and resident DJs RJ Duran & CES in the name and energy of our fellow African peoples!!! Located at Bar Standard in downtown Denver, expect sumptuous cocktails, high fashion, fabulous people and a fabulous time! Additional donations are always accepted!